Robbing a liquor store in Grand Theft Auto 5 is easy. All you do is go inside the store, take out your gun and point it at the person behind the register. They then proceed to put all the money in a bag, hand it to you, and you're on your way. 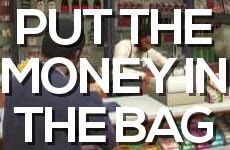 You can also rob other stores like clothing stores and barber shops, although, you may have noticed it's not as simple. Here's a video on how to do it. So basically, just point the gun at the clerk from outside. One thing to keep in mind is that there is always a small possibility that the clerk will take out a gun instead of a bag for the money, so watch out. Also, when robbing Ammunation, remember that there are two cash registers. If the clerk is out of the picture, you can walk up to the cash register and press the right arrow on the d-pad to take out the money yourself. Here's a nice map of all the locations you can rob. Apparently courtesy of gamingreality.com. These are just the convenience store though, remember you can rob any place with a cash register as long as there is a way in. When playing GTA V online, the places you can rob are marked on the map.